The Helz Cuppleditch Fun Fair collection is lovely to work with, the papers are so cheerful and make gorgeous spring/summer cards. 2. This time instead of using designer paper I thought I'll try something different and I've used 6x6 card from Fun Fair collection with circle window. Cut the card in half, the first layer is 1cm smaller than the base, second (the one with the window) is 1cm smaller than the first one :) Stick first layer on with glue. 3. Then take one of the wooden frames from Fun Fair collection and gently cut it in half at the corners, Pieces of frame stick on in the corners between layers. 4. Cut two circles. I've used Fun Fair paper for larger circle and plain white card for another. Then stick on flowers and buttons. 5. Layer the circles and stick inside the window using foam tape. 7. 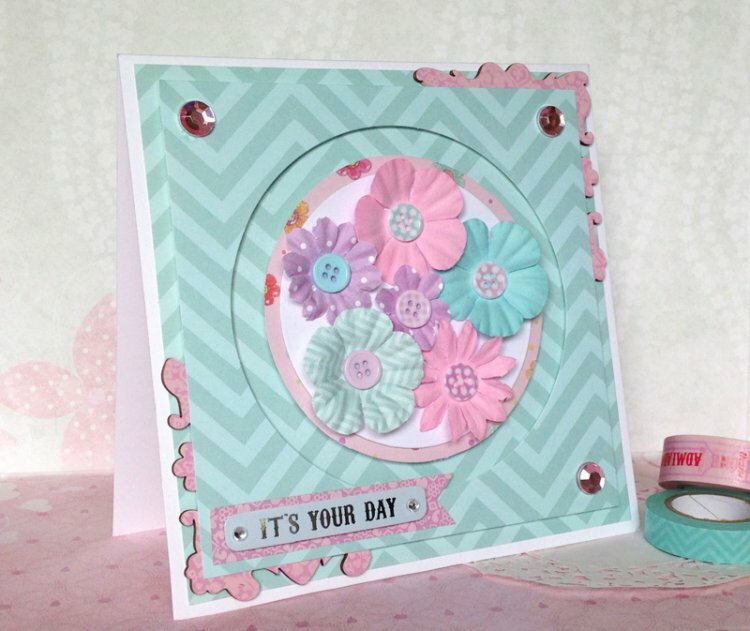 In one corner of my card I've added sentiment layered on a garland flag and in the other 3 corners some pink gems. We love how Emilia has used the wooden frames to create corner embellishments. Share your projects with us in our project gallery.